The first thing that struck me about his was his androgynous body--he does look kinda femmy, you know? I have a feeling he aspires to the market that Boy George used to sustain; he is the New Karma Chameleon. He also seems to be wearing mascara and lipstick, is that a microphone hidden behind his back? Yeah, Howie's an aspiring rock star, and he's got a message of love, plus he's going to start a trend for pink shorts and combat boots--he's got a pink scarf on his neck too. See that big hair on his chin, it's quite exagerated. It reminds me of those Gillette commercials where they do the close-up animation of how that razor just bites 'em off at the root for a clean smooth shave. Well Howie didn't quite get to the root of the matter despite his quest, either that or he's preparing to audition for a Gillette commercial. He looks like veering his head away so you don't stab yourself on that hair if you approach him, he's also trying to keep you from mussing his makeup before he goes on stage. That thing behind him is a ladder to the stage and the dry ice in the cup is going to start smoking any minute now and the dice will act like disco balls on the floor, he'll rip the mike from behind his back and start singing his hit "273 Checks," which is the single he won the Grammy for. Yeah, he's got a zircon stud in his navel, number one with a bullet. I don't have anything yet for my deck to reside in. I never seen him like that before! I hope you will find a home for them soon. No one has! I had my doubts about posting that since it didn't seem terribly "correct." But I decided that I find the stories in the deck so charming that when I looked at a card myself, I would just say what it looked like to me as my own little story whether it tied into the conventional meaning or not. So Howie turned into an androgymous rock star with alarming chin stubble and a personal sylist who is fond of pink. That's what I saw. Of such things are eccentric recluses made. Now, if I get my William Blake poetry book in the mail today, I'll be all set. Howie, the Knight of Cups, is positioned on a platform – there’s a ladder leading up to where he stands. Maybe this shows that he isn’t exactly a ‘down-to-earth’ person? Or perhaps Howie just went up there because he was attracted to that large cup. The cup has a big heart on it, and could show Howie’s ideals and aspirations: true, unconditional, romantic love. It’s probably that large to show how important it is to Howie. 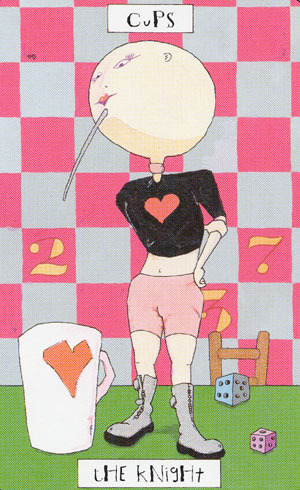 Howie is dressed rather... eccentrically: he wears a black top, pink hot pants and grey boots. I think he very much does what feels right to him, without paying attention to other people’s objections. I imagine he thinks it’s very important to express your personality and emotions to the fullest. That’s what I assume he was telling me about a drawing-course I’m following: don’t analyse or think too much, just draw spontaneously and with feeling. Actually, the teacher said that the quick sketches I did had the most character, and that I should continue in that spontaneous style. Howie’s big head is hairless, except for a very weird-looking goatee. I was thinking about how this could show that Howie directs his growth in unusual ways, and that he has his own way of expressing himself. Howie must practice yoga, because he’s holding his left arm with his right in a very strange way. I suppose this could show that he is actively and consciously (right) guiding and expressing his subconscious and his feelings (left)? [...] this guy is everyone's friend. People love to talk to him and tell him their secrets. Why? His posture where he's 'hiding' his arm behind his back seems to indicate to me that he'll keep any secrets you tell him and not whisper a word to anyone else. I wish I could see Howie like that too, but to me, he seems somewhat absent-minded and dreamy (he’s probably fantasising about all sorts of things), and also a bit proud, as if he feels very important. PS: Maan, your interpretation of this card is wonderful - you should jump in more often! Big heads and compelling characters and an endless story that goes on and on. Something about this deck. . . it isn't cute in any sense of the word.